El Camino Hospital was the first hospital in the world to computerize its medical information system. Along with building a new state-of-the art hospital, El Camino is continuing its healthcare leadership by developing a series of key service lines that are unmatched in the industry. However, their former brand identity did not support its new positioning or communicate critical new brand attributes of innovation and collaboration. 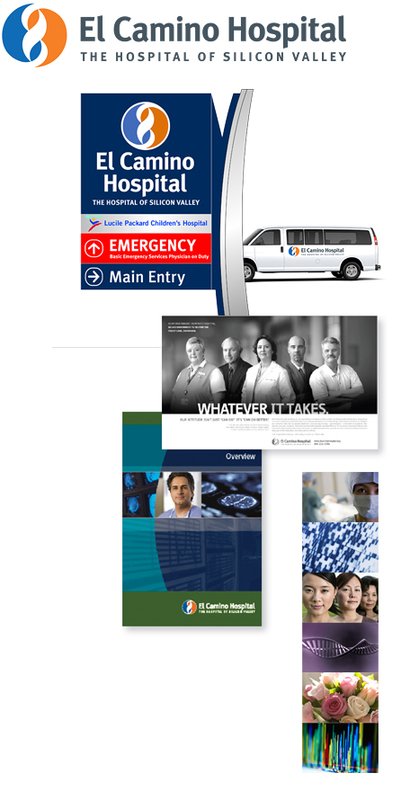 The new branding system resonates with all segments of the El Camino Hospital audience, including patients, staff and physicians, donors and the community. The new logo’s design reinforces both technology and collaborations through multiple elements that can be characterized as a unity of caring (orange) and innovation (blue), a stylized caduceus and a DNA double helix molecule. To ensure consistent communication of the brand in a unique and compelling manner, a comprehensive brand identity system was developed across a broad range of media including business stationery systems, marketing materials, website design and signing.